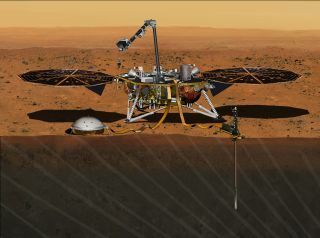 An artist's illustration of NASA's InSight Mars Lander on the Red Planet’s surface, which will not be ready to launch as planned in March 2016 because of a leak in the vacuum chamber surrounding one of its key instruments. InSight carries two main science instruments — a suite of three seismometers known as the Seismic Experiment for Interior Structure (SEIS) and the Heat Flow and Physical Properties Package, a heat probe designed to hammer itself 16.5 feet (5 meters) down into the Martian dirt. InSight — whose name is short for Interior Exploration using Seismic Investigations, Geodesy and Heat Transport — has a total cost cap of $675 million, $525 million of which has already been spent. NASA will need to determine whether or not InSight can still launch in mid-2018 while staying under the $675 million limit, agency officials said in December.